Though network security has become a significant issue in technology industries, it has been an afterthought at best in the transportation and industrial networking fields. Caltrans District 2 Office of ITS Engineering identified a commonly overlooked vulnerability and mitigated the problem using off the shelf hardware and configuration tools. 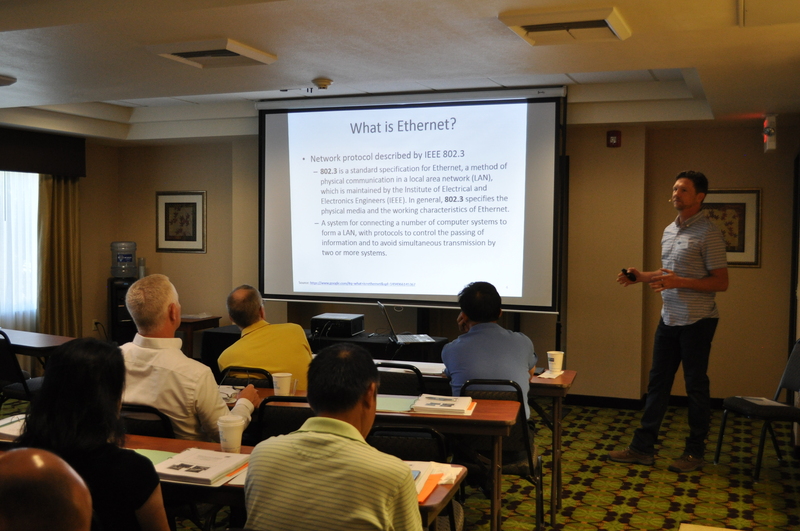 ITS engineers Jeremiah Pearce and Lonnie Hobbs discussed the District 2 Field Element Network (FEN) and the Point-to-Point Protocol over Ethernet (PPPoE) link security protocol that has been implemented. 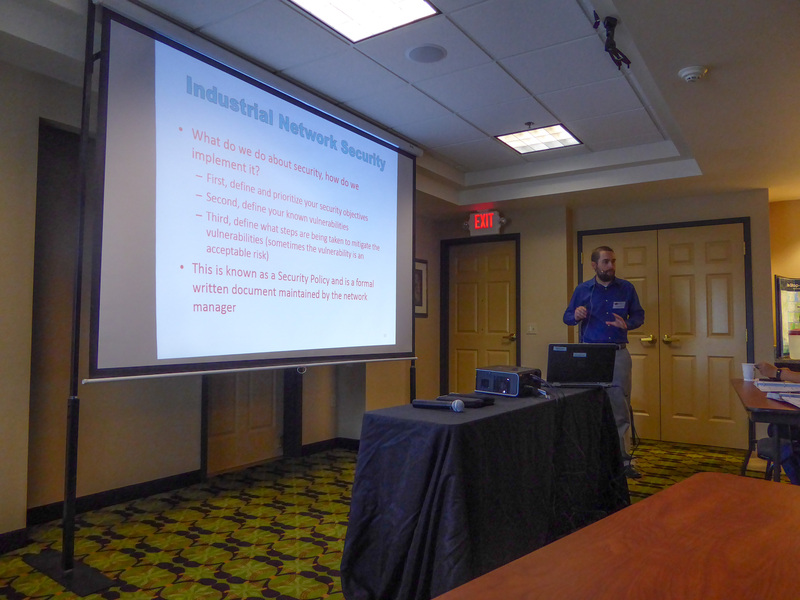 Jeremiah started with a review of industrial networks and security in general and then discussed the District 2 FEN vulnerabilities and mitigation strategies. Lonnie described the implementation of District 2’s PPPoE security protocol in detail, including hardware selection, router configuration, establishing a PPPoE connection, and password data encryption. The pair ended their presentation by demonstrating how easily access to the network could be gained without link security, and then how PPPoE could effectively mitigate this vulnerability. The Federal government has recently begun rule-making to require vehicle-to-vehicle (V2V) communication systems on new light vehicles. These V2V systems will likely be Dedicated Short Range Communication (DSRC) radios in the 5.9GHz range. As infrastructure owners and operators, this opens up the opportunity for vehicle-to-infrastructure (V2I) systems, including a broad variety of safety, mobility, and data applications and improvements. 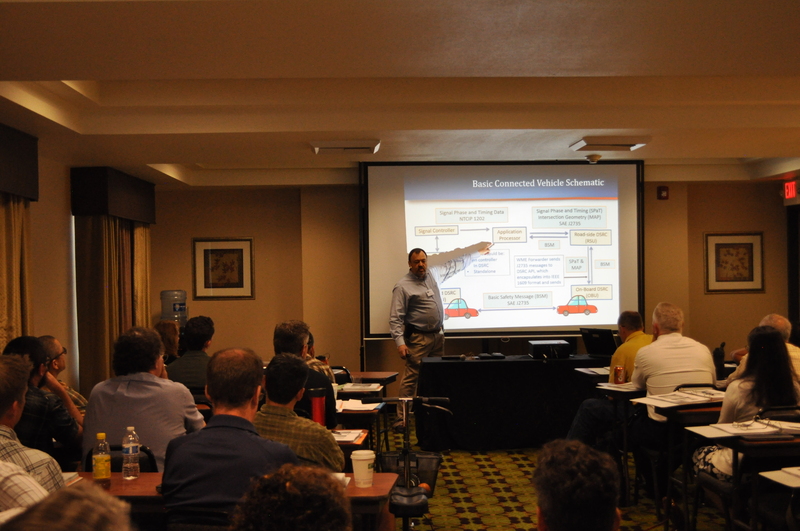 Utah DOT Technology and Innovation Engineer, Blaine Leonard, started his presentation with an overview of connected vehicle systems and then explained their DSRC deployment near Salt Lake City. 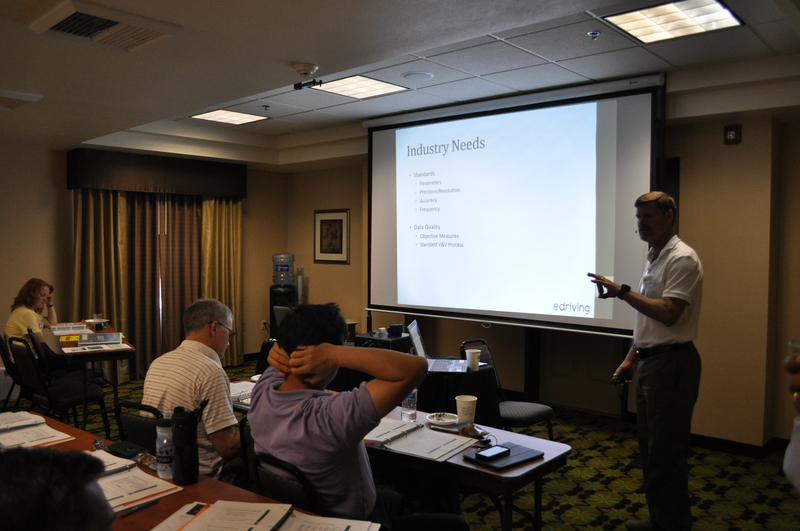 Blaine discussed location selection, software, hardware, installation and project costs. He then demonstrated the system and closed with a discussion about the challenges faced and recommendations based on lessons learned. Over the years, ODOT’s ITS Unit has developed custom systems to support a variety of roadside applications such as road and weather information systems (RWIS), high wind warning systems, ice warning systems, speed/curve warning systems, overlength and over height warning systems, and remotely controlled interstate gates. These systems were developed with a variety of hardware and software making them difficult to support over time as products and the agency’s IT environment changed. After adoption of the Advanced Transportation Controller (ATC), ODOT worked with the ATC vendor to develop firmware that allows the user to customize one application to support a variety of ITS systems. ODOT ITS Standards Engineer, Doug Spencer, provided some background on the project including a review of key points from several previous Forum presentations related to the ATC and custom ITS applications. He reviewed the various needs for the ITS firmware, uses of the ATC, and the many different sensors and devices that can be operated in a standardized way utilizing the ATC and the controller’s application programming interface (API). Doug showed how the various devices/systems could be configured, and discussed the ITS firmware database, events logs and sensor and system recoding. He described some of the testing done with the new firmware and then talked about a number of new deployments using the ITS firmware. To more effectively manage the asset life cycles of more than 2000 pieces of network-connected ITS field equipment, the Nevada DOT deployed a GIS-based, mobile asset management system. NDOT Technology Manager, Jim Whalen, first reviewed the need for the project and then explained the steps taken to assess what equipment was deployed where, and what information needed to be collected relative to the various assets. He described how NDOT configured activity-based workflows to tie service requests and work orders to these assets using internet-connected and disconnected mobile platforms. Jim demonstrated the various features of the system and discussed how NDOT is using the information to better manage traffic system assets. Now in its fourth phase, this multi-phase research project is aimed at combining functionality of WeatherShare, SCAN WebTM and SCAN SentryTM into a single, open system. In this phase, the project team has continued work on the retrieval, storage and presentation mechanisms, developed alerting and user profile mechanisms for the system, and worked with Caltrans to test and evaluate the system during the bad weather season. 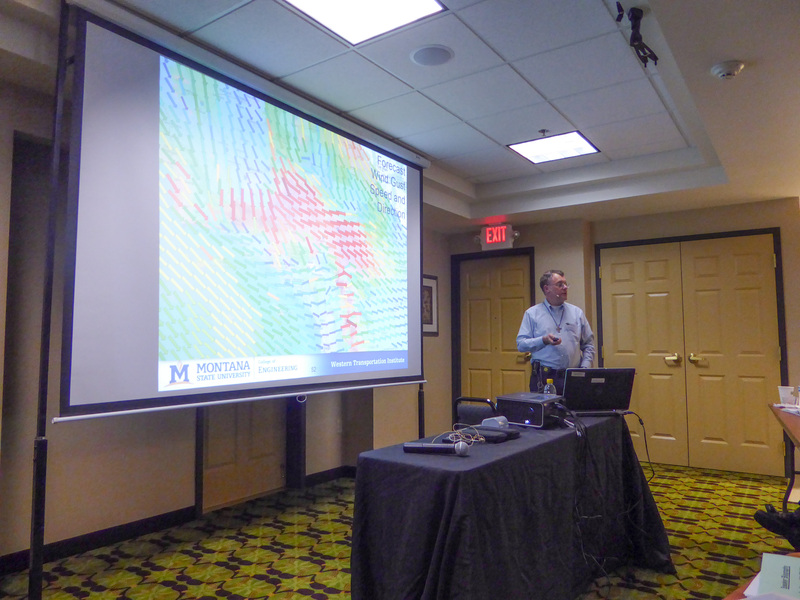 WTI Principal Investigator, Doug Galarus, reviewed the history of the project and the need that led to this fourth phase. He discussed the concept, requirements, design and implementation of the system, including some example use cases. Doug walked through the various features of the system, as well as the administrative functionality and technical details related to implementation. Automated signal performance metrics show real-time and historical functionality at signalized intersections. Accurate decision-making about signal performance and timing helps signal management personnel identify vehicle and pedestrian detector malfunctions. This cost-effective solution also measures vehicle delay and the volume, speeds and travel time of vehicles. 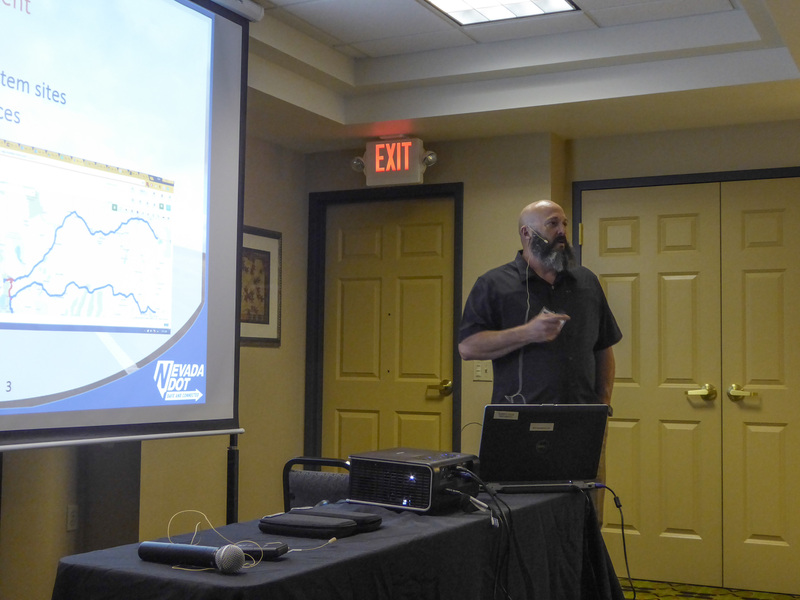 Utah DOT’s Statewide Signal Engineer, Jamie Mackey, described how UDOT has used these metrics to detect operational deficiencies, optimize mobility, and manage signal timing and maintenance. 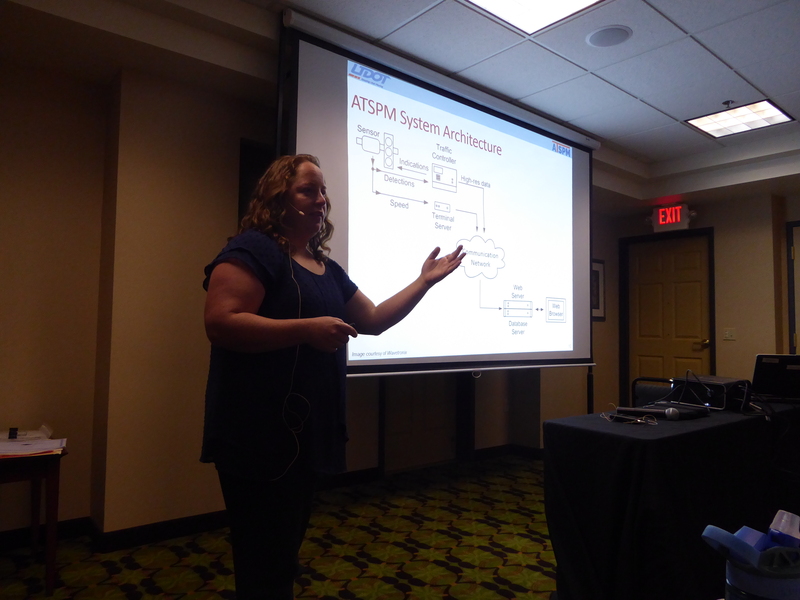 She discussed the hardware requirements, described the system and its features, demonstrated the UDOT system, and explained how other agencies can acquire and use the software. Traffic safety analysis generally relies on historical traffic crashes to identify hazardous roadway locations. This data is collected over long periods of time. However, recent research efforts are seeking to define better and more efficient methods for identifying such locations, including the use of naturalistic driving studies and identification of near crashes or crash surrogates. 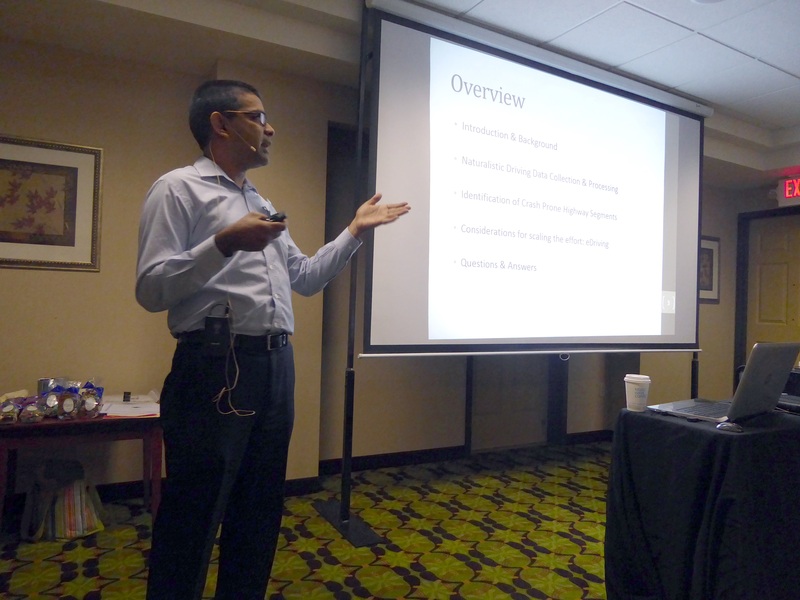 In this presentation, Dr. Anurag Pande and Stephen Lakowske from Cal Poly, San Luis Obispo, described their research study that is utilizing naturalistic GPS driving data. Dr. Pande described the data collection methods and the devices used. He shared the results and the subsequent data analysis. Mr. Lakowske then discussed technical considerations, industry needs, and various data collectors, including smartphones, that could be used to scale up such data collection and analysis. Note: PDF contains embedded video clips and is ~39.1 MB in size. Adobe Reader 9 or higher is needed to view these video clips. A version without embedded video (~4.2 MB) is available here. California vehicle law 21450.5 mandates that new/upgraded traffic actuated signals must detect bicycles and motorcycles. 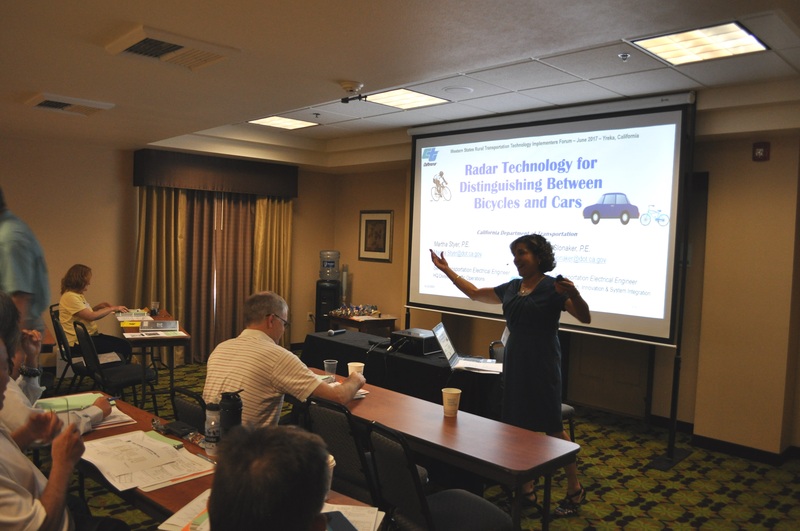 Continuing the work presented at the 2013 Western States Forum, Caltrans has been testing a microwave radar detector that can distinguish between bicycles and cars or trucks. Martha Styer, Caltrans Senior Transportation Electrical Engineer, described the project and testing being done with the radar detectors. She shared the results of studies in West Sacramento and Huntington Beach including lessons learned. She also discussed the C1 traffic detector reader and analyzer which is an inexpensive tool developed by Caltrans to diagnose and troubleshoot vehicle detector problems. In this application, it is being used to collect real-time data flowing between traffic controllers and controller cabinets and then validate the data by comparing to video ground truth. 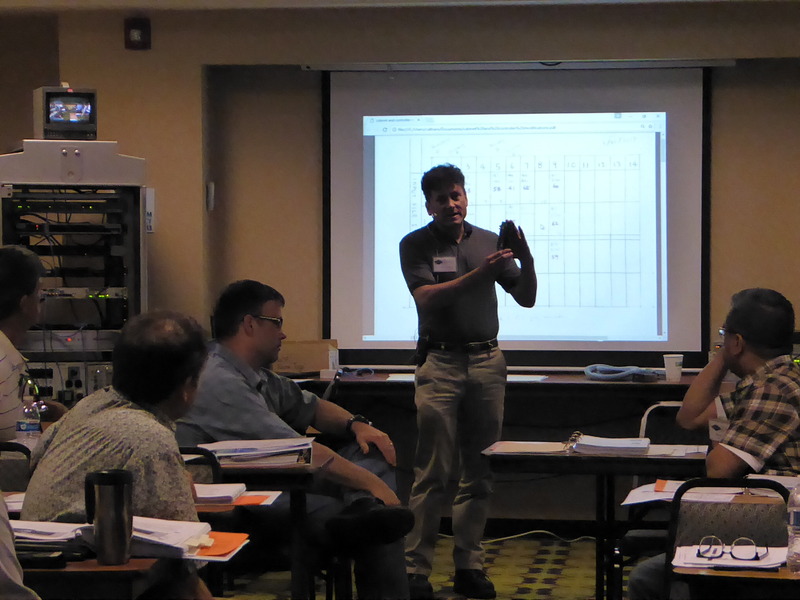 John Slonaker, also a Senior Transportation Electrical Engineer, showed the C1 reader and its components and demonstrated the VideoSync software used for this project.